The Green County Public Library Genealogy Department will be CLOSED until further notice due to renovations of the building. We apologize for any inconvenience this may cause. Research requests may be emailed to history.green@yahoo.com. Ms. Laura will respond as soon as possible. 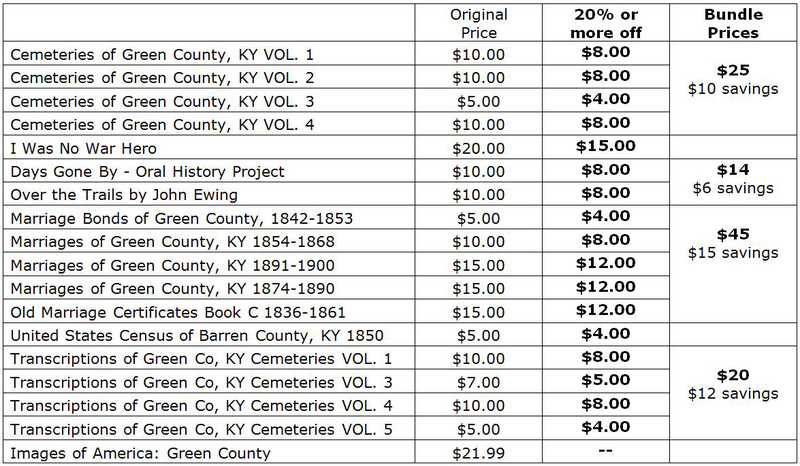 The Green County Public Library has an extensive collection of genealogy material. Some of the collection was compiled and donated by individuals doing their own family research and some were published works purchased by the library. Other materials were family documents, photos, letters, etc. passed down through the years and many are public record. Everyone is invited to visit the library and search the collection. Ancestry Library Edition is available to patrons on library computers at no charge. Genealogies of Virginia Families 12 VOL. Draper Collection of Manuscripts 6 VOL. Kentucky Bible Records 6 VOL. No genealogy material will be taken out of the library. No exceptions. The library does not assume responsibility for contents of books placed in the library. www.familysearch.org - FamilySearch is the largest genealogy organization in the world. Access records and resources at no charge. www.kyhistory.com - The Kentucky Historical Society. Access oral history and get information on their programs and services. Research their online resources to get many useful links and can even search vital statistics. http://kdl.kyvl.org/ - Kentucky Digital Library. Access historic newspapers, photos, books, maps, and more. www.rootsweb.com/~kygcgs/ - Green County Genealogical Society homepage. Get information about becoming a member, events to be held, what books are for sale, and links to other useful sites. www.rootsweb.com/~kygchs/ - Green County Historical Society homepage.